Gerry Charnoff was honored Sunday morning for his lifetime of service to the Jewish community by Maryland Hillel. A new Sefer Torah was commissioned in his name by Miriam and Dr. Allen Schick, a research professor and renowned Brooking Institute fellow, as the community celebrated Charnoff’s legacy. 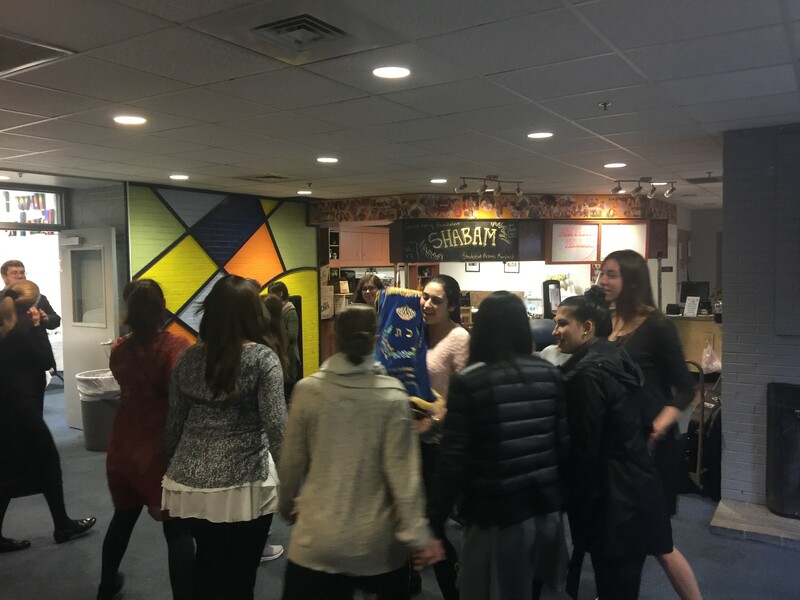 Hillel threw a celebration for Charnoff, whose commitments and role model presence provided “many of our community’s most fundamental institutions,” according to the event’s flyer. Director of Institutional Advancement at Maryland Hillel Shuli Tropp praised the Schick family and the rest of the Jewish community for making this dedication possible. Schick, 83, said he has been friends with Charnoff for 44 years, saying Charnoff’s humbleness and moral support has been helpful throughout his life. A group of female students dances around a fake Torah scroll. Christian Spencer/Mitzpeh. Instead of dedicating the new Torah to himself or his wife, Schick decided Charnoff was a better fit for such recognition. The Torah is expected to be transported outside of Hillel and used for touring purposes, including inside a prison. Charnoff was best known for his legal career as well as being a devoted Jew. With a B.A. from Brooklyn College, an M.A. from Columbia University and a Bachelor of Laws degree from New York University School of Law in the class of 1957, Charnoff made connections in Washington D.C.’s Jewish community in the 1960s, specializing in international transactions, administrative litigation, and energy. He served as president of the Berman Hebrew Academy, is a board member of the Jewish Federation, and is a National Vice President of the American Israel Public Affairs Committee. Members of the Jewish community gather for the dedication. Christian Spencer/Mitzpeh. Although Charnoff resides in New York with his wife Deborah and was not there to accept the honor in person, his grandchildren Miriam (class of ’21 at UMD), Oren (’14), and Sam Charnoff were present in a tribute to their grandfather. Orly Mechaly, 65, said she knew Charnoff through her daughter was friend with one of his daughters at Charles E. Smith Jewish Day School in Rockville and they are working with each in New York. Mechaly said Mr. Charnoff helped Mrs. Charnoff, who is a member of the Charles E. Smith Jewish Day School’s board of directors and co-chair of Operation Excellence, create a second campus for upper school students. “He has done so many wonderful accomplishments. I get choked up just thinking about it,” Mechaly said. 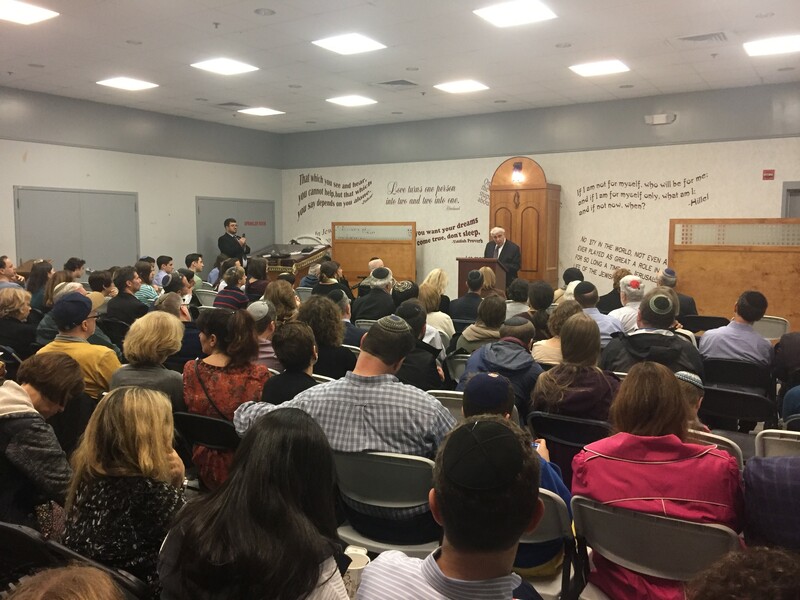 Mr. Schick spoke in his native Hebrew language throughout his speech praising Charnoff, and the attendees afterwards danced to a jazz band rendition of Israeli folk music and had a Kosher brunch. No Replies to "Hillel honors Gerry Charnoff with Torah dedication ceremony"